I really like the focusing, illuminated from 3D World. It is a tremendous value since it sells for less than $100 (as of October 2008). I am, however, always looking for improvements and I found myself wondering why my viewing experience felt less “encumbered” when using my Saturn Viewer. It was difficult to peg down the difference, but viewing through the Saturn Viewer seemed more pleasant. Was it due to the larger diameter lenses of the Saturn Viewer or something else? 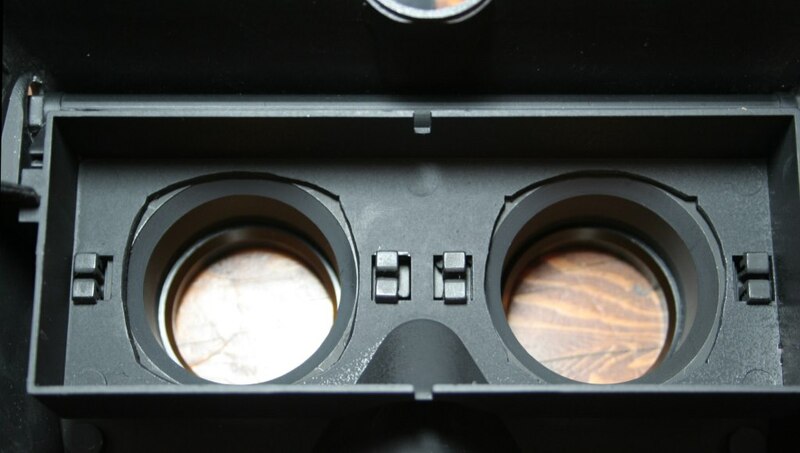 I then went back and tried viewing the same images in my 3D World fixed focus viewer. There I think I identified the difference. 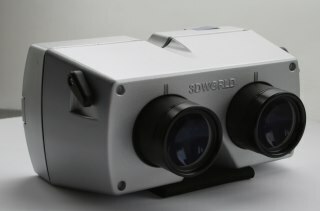 With both the 3D-World fixed-focus viewer and in the Saturn Viewer, there was nothing much between the lens and the slide. 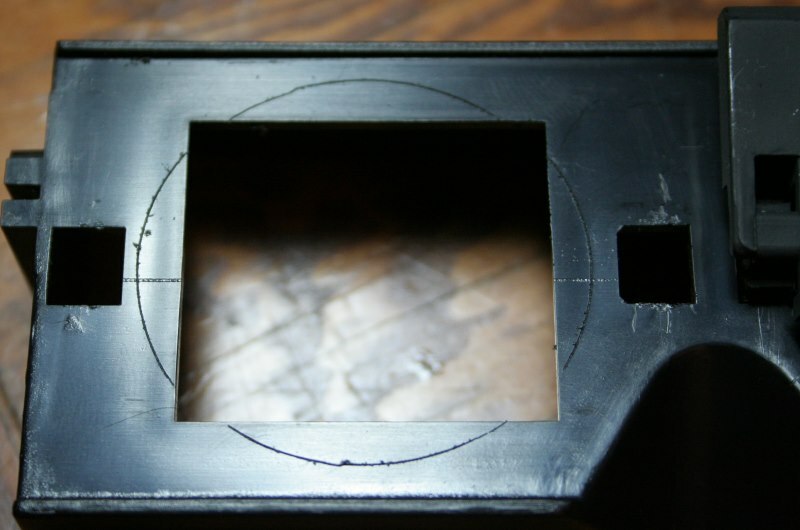 The 3D World focusing viewer included two baffles restricting the view. By design, these baffles were out of the path of the image. They did not vignette or clip any part of the image. They were, however, visible and I suspected they were distracting my eye and drawing my attention away from the image. The viewer focuses using a rack and pinion to move a square carrier fore and aft. The lens cones are mounted on that carrier (and independently slide left and right to provide interocular adjustment). 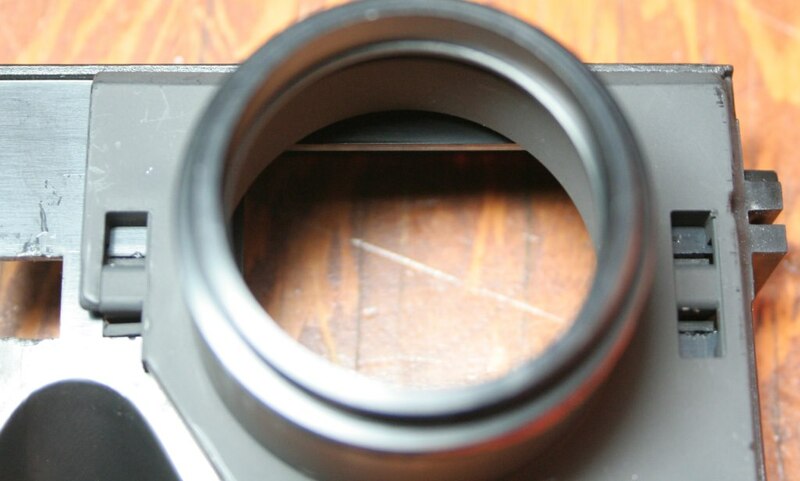 The apertures behind the lens cones are rectangular and easily visible in the flanking photographs. To test my hypothesis, all I had to do is open these apertures a bit and reinstall the lens cones. Removing the lens cones from the carrier was actually more difficult than wielding the dremel tool used to enlarge the openings. With the cones removed, I found a RotoZip blade was just right for the bulk of the work. When that was done, I switched to a small sanding drum to dress the edges more neatly. The viewer on which I was trying this is one of the original batch which has a high-gloss carrier in it. While the viewer was apart, I took the opportunity to paint the inside of the carrier with some Krylon Ultra-flat black paint. 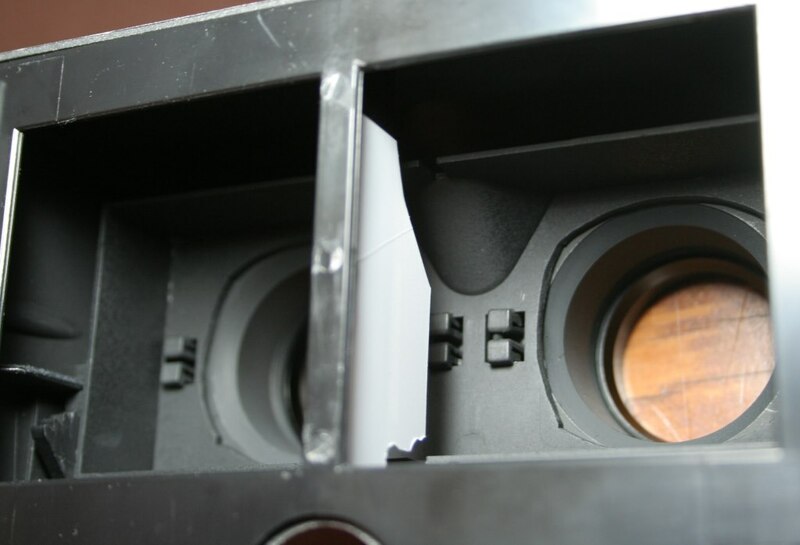 I then reinstalled the lens cones and put the carrier back in the viewer shell. When I dropped a slide in the modified viewer, I noticed a couple of things. Removing the close-in mask did reduce eye-distraction. My eyes spent more time on the image and less time darting in to check on this “thing” close to my eyeball. This was good, but in fixing one deficiency, I had created another. One function of the rectangular apertures which I hadn’t appreciated was their contribution to the occlusion of the “other eye’s” image. With the rectangular apertures and the short septum provided on the mount-carrier (not present in the above image), the left eye was unable to see right image and the right eye was unable to see the left’s image. In my newly modified viewer, both images were easily visible to both eyes. This pretty much negated any benefit I had achieved as there were even more optical distractions available. Fortunately, it was relatively easy to correct this problem. With a little bit of styrene and a sharp pair of scissors, I created an extension for the viewer’s short septum. It was easily shaped to clear the nose indentation and the focusing rod, and a dab of glue held it in place. Because photographing ultra-flat black is so difficult, I left it white for the photograph. I then applied more of my flat black to the mount-carrier and new septum before reassembling the viewer. The results of all this are an increase in my satisfaction with the viewer. With the wider apertures, my eyes spend less time checking that little bit of close-in visual noise. Yes, it’s a small improvement, but it is a small improvement I will make to my other 3D World focusing viewer the next time I have it apart. I’d suggest that a taller septum and larger lens apertures would be low cost improvements the manufacturer could incorporate in the future.